Every tortilla dreams of being stuffed with Carnitas. 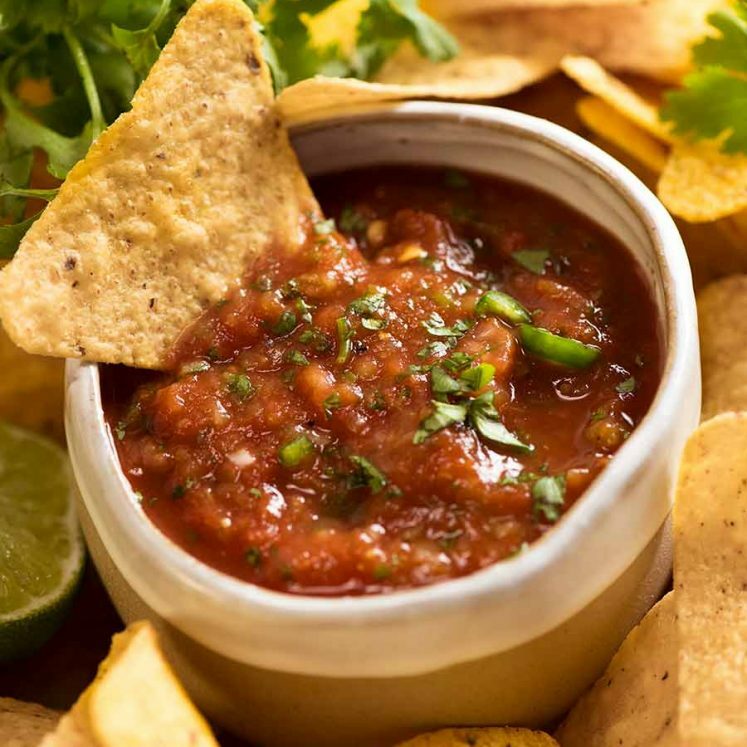 The best of the best of Mexican food, seasoned pork is slow cooked until tender before gently teasing apart with forks and pan frying to golden, crispy perfection. Pork Carnitas are that elusive combination of juicy and crispy with perfect seasoning – and this Carnitas recipe requires just 5 minutes prep! 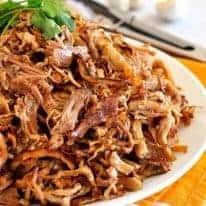 Made with all natural ingredients like traditional Mexican Carnitas, these Carnitas can be made in the slow cooker, pressure cooker or oven – directions provided for all. Is there anything better in this world than pork slowly cooked until it’s crazy juicy and fall apart tender, then crisped to golden perfection? Carnitas is one of my specialities. I make this recipe often – for everyday purposes, a freezer standby and for taco-bar gatherings with friends! If you’re new to Carnitas, let me be the first to welcome you to your new addiction. 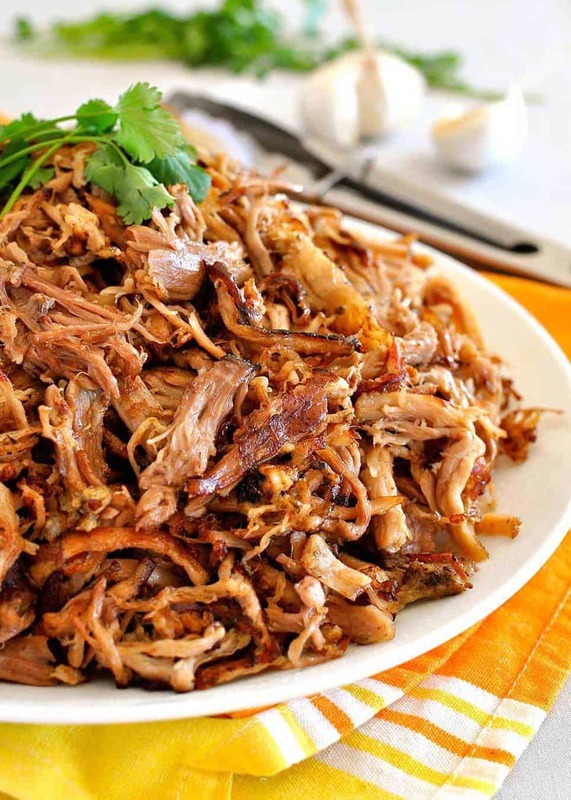 Carnitas are Mexico’s version of pulled pork. It’s the first thing you seek upon landing in Mexico. It’s why we trawled the back streets of Mexico City in torrential rains, hunting down a hole-in-the-wall carnitas joint that was popular with locals. Made by slow cooking pork fully submerged in lard, this confit method of cooking yields pork that’s unbelievably rich and tender with loads of crispy golden bits. Unfortunately for most home cooks, a huge cauldron of lard isn’t viable or practical. But fortunately, it is possible to make carnitas that tastes very similar to authentic Pork Carnitas without gallons of lard. And it’s unbelievably simple. Carnitas seasoning – rub pork with a simple spice mix of oregano, cumin, salt and pepper. Flavour for cooking – top pork in slow cooker with onion, garlic and jalapeño, then pour over orange juice (the secret ingredient!). It sounds so simple, but with hours of slow cooking, mingling with the pork juices, it transforms into the most incredible braising broth that more than makes up for the absence of gallons of lard. Pan fry until golden, doused with the juices from the slow cooker. Pan frying is so much better than broiling/grill or oven! 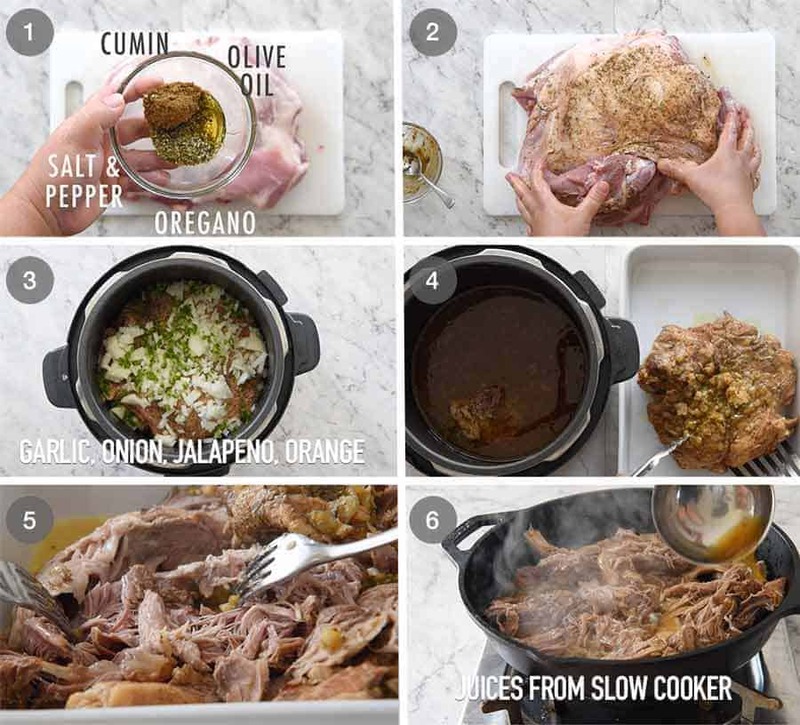 Can Carnitas be made in an Instant Pot or pressure cooker? Yes! The outcome is exactly the same – no one can the difference once browned in the skillet. I make this in a pressure cooker when time is of the essence! 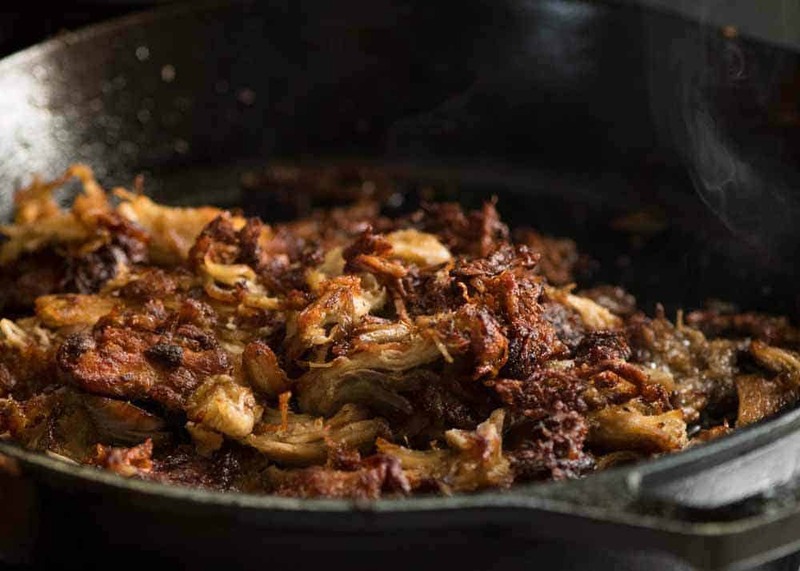 The BEST Pork Carnitas are browned in a skillet! 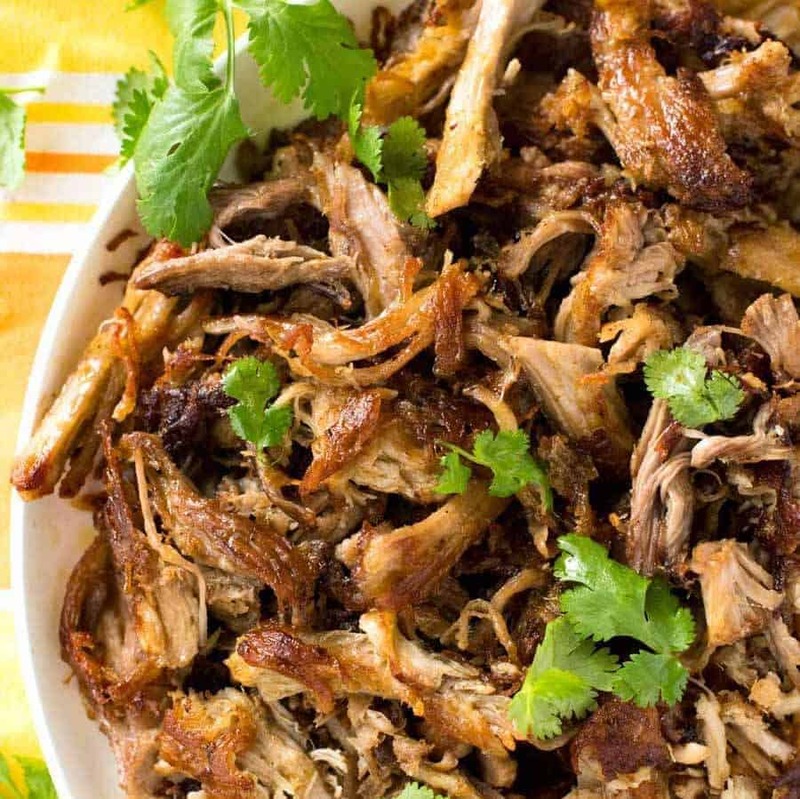 Don’t skip the step to brown the Pork Carnitas! This is the key that makes this the best Pork Carnitas you will have outside of Mexico. Hand on heart, it is as good as the carnitas I had at a really authentic Mexican joint called Old Town Mexican Cafe in San Diego which is famous for its Pork Carnitas. So if you think you’ve had great carnitas before, but you haven’t tried browning in a skillet, this is going to be a game changer! 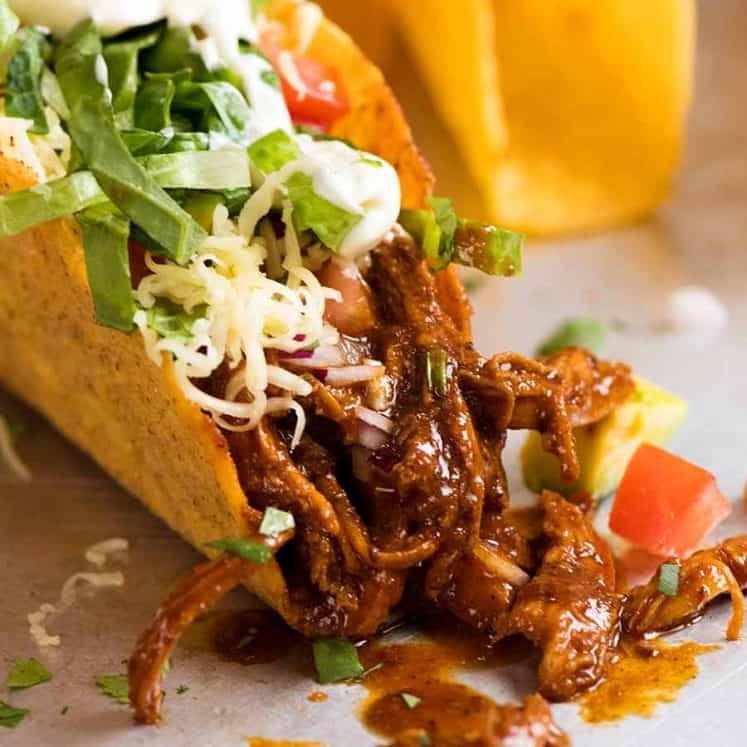 While I have a great fondness and tendency to favour Tacos de Carnitas (Pork Carnitas Tacos), pork this juicy and full of flavour is highly versatile – plus it freezes 10000% perfectly. I use Pork Carnitas to make Enchiladas, Burritos, Quesadillas, Sliders, Mexican pizzas. I toss them into my Mexican Fried Rice (don’t laugh, this is a firm favourite with many readers! ), and I make Carnitas Plates – pile Carnitas over Mexican Red Rice with a side of Pico de Gallo or Guacamole, and steamed corn. 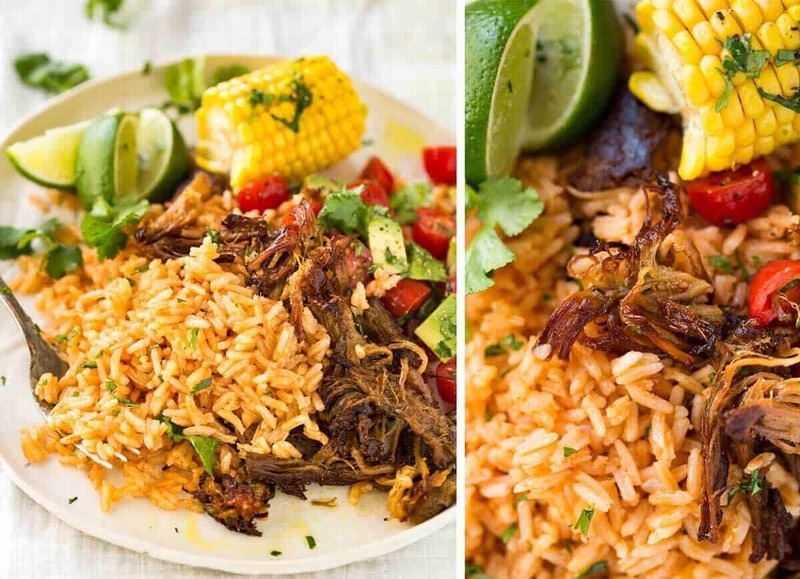 • You’re just 5 minutes away from getting this Pork Carnitas in your slow cooker, pressure cooker or oven. • It can be frozen without any loss of quality. • There are easy ways to pan fry to golden perfection and still be juicy and fresh hours later – even after refrigerating. Slow Cooker Pork Carnitas recipe video! Is that a pressure cooker in the video?? Yes and no! My slow cooker (Breville Fast-Slow Cooker) is like an Instant Pot. It’s multi-functional, a pressure cooker and slow cooker in one. Hence why it looks like a pressure cooker with the twisting top. The slow cooking function is no different to any standard slow cooker. Recipe VIDEO above. Spiciness: Not at all. Scale recipe using Servings slider. 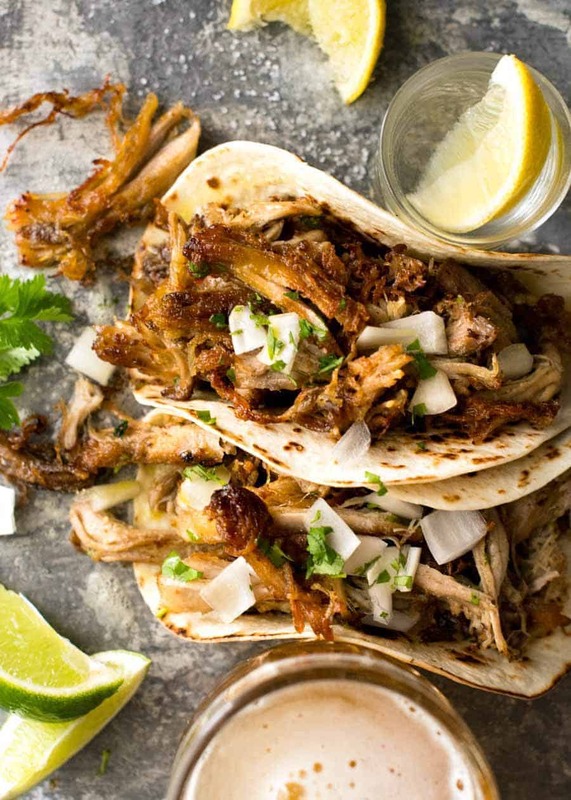 These carnitas capture that elusive combination of flavourful, juicy AND crispiness. Pan frying to get the golden bits is not optional! Broiling/grilling will not produce the same results. Stuff them in tacos for an authentic Carnitas Tacos experience, see notes for other uses! FAQ below recipe. If you have a lot more than 2 cups of juice, then reduce it down to about 2 cups. The liquid will be salty, it is the seasoning for the pork. Set liquid aside - don't bother straining onion etc, it's super soft. Heat 1 tbsp of oil in a large non stick pan or well seasoned skillet over high heat. Spread pork in the pan, drizzle over some juices. Wait until the juices evaporate and the bottom side is golden brown and crusty. Turn and just briefly sear the other side - you don't want to make it brown all over because then it's too crispy, need tender juicy bits. Remove pork from skillet. Repeat in batches (takes me 4 batches) - don't crowd the pan. Just before serving, drizzle over more juices and serve hot, stuffed in tacos (see notes for sides, other serving suggestion and storage/make ahead). 1. The Pork: Use pork with the skin removed but leaving some of the fat cap on. The fat adds juiciness to the carnitas - and excess fat can be skimmed off later. 1 - 1.5 kg / 2 - 3 lb: 8 hours on low. 1.5 - 3 kg / 3 - 6 lb: Cook time per recipe. 3 - 4 kg / 6 - 8 lb: Use large oval slow cooker, 12 hours on low. Electric pressure cooker or Instant Pot: 1 h 30 minutes on high. Let pressure release naturally. Proceed with Step 5 of recipe. Stove pressure cooker: use a rack or balls of scrunched up foil to elevate it from the base OR add 3/4 cup of water. Cook 1 h 30 minutes. Proceed with Step 5 of recipe. Oven: Follow recipe but put pork in roasting pan. Add 2 cups water around pork. Cover tightly with foil, roast in 325F/160C oven for 2 hours, then roast for a further 1 to 1.5 hours uncovered. Add more water if the liquid dries out too much. You should end up with 1 1/2 to 2 cups of liquid when it finishes cooking, and you can skip the pan frying step because you will get a nice brown crust on your pork. Shred pork then drizzled with juices. 3. 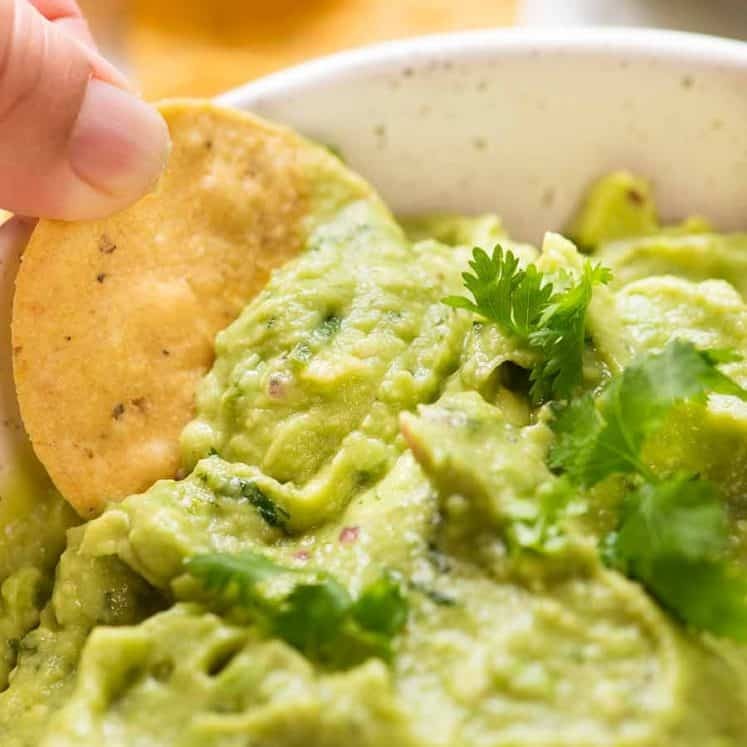 Taco Fixings: Diced avocado or make a real proper Guacamole, Pico de Gallo or Restaurant Style Salsa or even just sliced tomato, grated cheese, sour cream. Sliced lettuce or pickled cabbage / red onions would also be great, but unlike other tacos, you don't need it for the texture because the carnitas have the crispy bits! Also see this Carnitas Tacos dinner spread. 4. 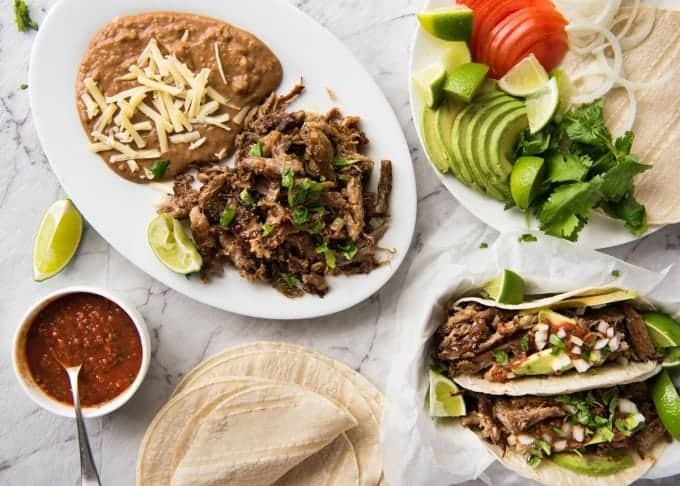 Other Ways to use Carnitas: Burritos (switch for the beef), Quesadillas (baked version here), Enchiladas, Sliders, with Mexican Red Rice, in Taco Soup or Enchilada Soup. 5. Storing / Make Ahead: Crispiness is retained very well, main thing is loss of moisture as meat cools (happens with all meat, shredded meat cools faster). a) Best way to store: Shred pork but don't pan fry. Keep pork and juice separate, refrigerate up to 3 days or freeze up to 3 months (for freezer, I put pork in containers/ bags and put juice in ziplock bags in the same container). Gently reheat juice to make it pourable (congeals when cold). Pan fry per recipe, drizzling with juice. b) Storing leftovers after pan frying: Keeps extremely well, but tends to lose juiciness when it cools down. Just drizzle with juice, cover with cling wrap and reheat - the crispy bits hold up very well. It's not quite as crispy as when cooked fresh, but still seriously tasty. c) Brown pork a few hours ahead / keep warm: Works extremely well. Brown pork per recipe, then transfer to slow cooker on warm setting or food warmer and drizzle generously with juices to keep it moist. Cover loosely. As long as the pork is warm when served, it's really juicy. The crispiness holds up extremely well. 6. Source: This is a recipe I've been making for over a decade now, with minor tweaks over time so I can't remember the exact source. I want to say Rick Bayless but I can't find the recipe, however, I did find this one from Food Network which is very similar. However, I'm not sure when it was published. 7. Nutrition per serving, pork only, assuming 12 servings. Calories is higher than it actually is because it does not take into account discarded fat. 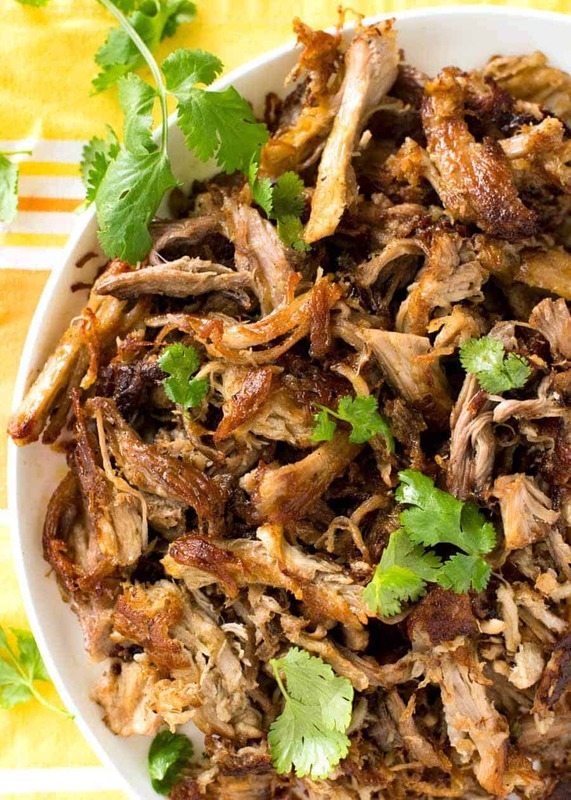 Carnitas recipe originally published 2014. Updated with new photos and video in 2018, and some housekeeping in March 2019. No change to recipe, I wouldn’t dare! This has been one of the all time most popular recipes since I first published it! Can I use pork tenderloin? Sorry to say it’s not suitable for this recipe. Tenderloin is too lean so the long cook time will dry it out. Also, it does not shred into strands well. Just to confirm – no liquid other than the juice from the oranges?? Really? YES, really. 🙂 The small amount of liquid from the oranges is all you need to keep it from drying out while it comes to temperature, then while it cooks the pork will drop juices. When this finishes cooking you will have more liquid than you started with. Will it taste of oranges?? ??? Nope, not at all! It magically turns into the most incredible broth that is then poured over the shredded pork. Can I cook a frozen pork? Please don’t! This will mess with the cook time a lot because it will take sooooo long for the middle of the pork to cook, by which time the outside will be overcooked and when you shred it, it will almost look like mush! The pork must be defrosted! After I skim off the fat, do I include the onions garlic and jalapeños when topping the meat, or do I discard these and only use the juices? It is up to you! Because it’s been slow cooked, the onion etc is really soft and it just melds into the pulled pork. I don’t bother straining it, but you can if you want to. Just to confirm – no pan frying to brown the pork before putting it in the slow cooker? That’s right! You brown the pork AFTER it is cooked and shredded. What size slow cooker do you use? Mine is 6 quarts / 6 litres. I use this Breville Fast / Slow Cooker (I’m in Australia) which I love because it’s a pressure cooker and slow cooker in one, plus it has a saute setting! It’s basically an Instant Pot – but without one touch cook functions (like rice etc). I first published this recipe back in 2014, when I was new to blogging. I took sooooo long with the photos – prolonged torture for Dozer! O my goodness I am hooked! I felt like I was home and my grandma was cooking. That’s so great to hear Trini! Best carnitas ever! I have made this recipe several times and cannot say enough about how good they are. I’ve prepared them as tacos, enchiladas and just as is with a couple side dishes. No changes are needed to this recipe and do make sure you crisp the meat as directed. Make a lot because it really does freeze well. Nagi, you have a real winner here. Hi! These carnitas look AMAZING! 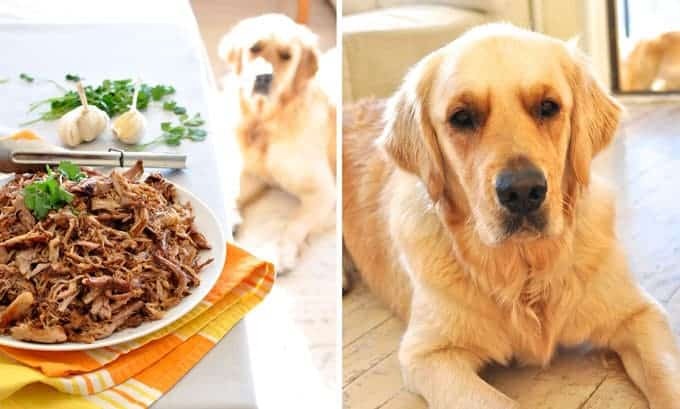 I can’t wait to try them just wanted to know how much of each ingredients to use if I’m only using 1 lb of pork shoulder (it’s just two of us at home) and also I didn’t see what kind of onion to use yellow onion or white onion?